Abdominal colostomy has been reported as an option with good quality of life for patients requiring abdominoperineal resection (APR) for very low rectal cancer. Some young, compliant patients, nevertheless, are very motivated to avoid abdominal colostomy following APR. Spiral smooth muscle cuff perineal colostomy as neosphincter reconstruction can be a reasonable alternative. We have published before the results of a series of sphincter reconstruction in the conventional technique following APR. As we developed our technique for colorectal resection sphincter reconstruction, we also changed to a laparoscopic approach. The aim of the present study was to evaluate the feasibility of laparoscopic neosphincteric reconstruction and outline the aspects of the technique. 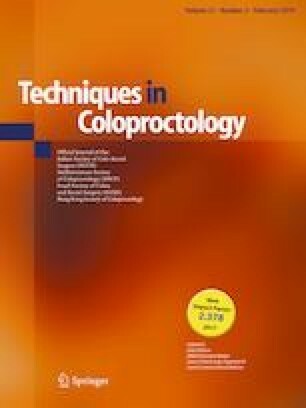 This retrospective study was conducted on 15 patients treated at our institution during a 6 year period for low rectal cancer by laparoscopic APR and spiral smooth muscle cuff perineal colostomy as sphincter reconstruction. At follow-up at a median time of 3.7 years (range 3–9 years) after surgery, patients underwent functional evaluation which included the modified Holschneider continence score (0–16), assessing consistency of stool, frequency, impulse, discrimination, warning period, incontinence for formed or fluid feces, soiling, wearing pads, drugs, enema where a score of 13–16 is associated with normal continence, as well as neosphincter manometry. Laparoscopic sphincter reconstruction was feasible in all 15 patients. Two of the fifteen patients (13%) required secondary colostomy in the long term due to neosphincter malfunction and neosphincter perforation after enema. Four of the remaining thirteen patients (30%) were partially continent according to the Holschneider continence score (HCS) with a score of 7–12. The other 9 (70%) were continent (HCS: 13–16). Neosphincter manometry showed a median resting pressure of 33 cm H2O (range 30–41 cm H2O) and a median squeeze pressure of 95 cm H2O (range 84–150 cm H2O). Laparoscopic sphincter reconstruction following APR is a feasible option offering an alternative to abdominal colostomy for selected patients. All procedures performed in studies involving human participants were in accordance with the ethical standards of the international and national research committee and with the 1964 Helsinki declaration and its later amendments or comparable ethical standards.